CHAPEL HILL, North Carolina. -- The University of North Carolina Department of Athletics is implementing a clear bag policy at Kenan Stadium for the 2017 football season. 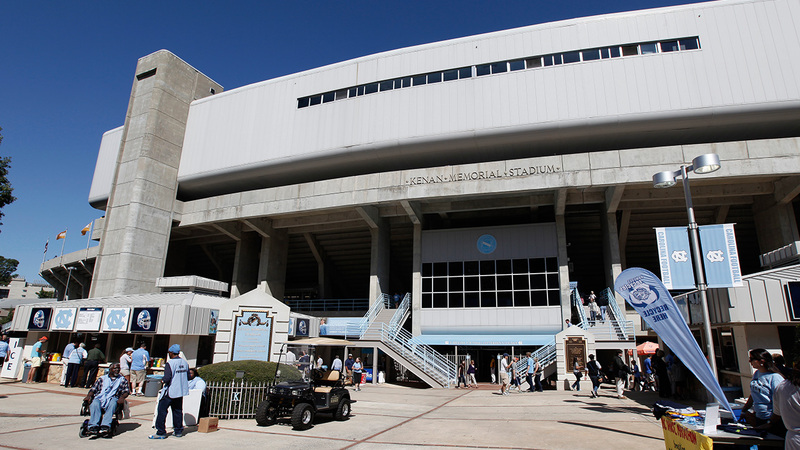 The new policy is expected to reduce wait times for fans entering the stadium and put UNC in line with most college and professional venues in terms of fan safety measures. - Any clear plastic or vinyl bag no larger than 12" x 6" x 12", including gallon freezer bags. - Small clutch purses no larger than 4.5" x 6.5". - Necessary medical items following inspection at entry gates. Prohibited items include: purses larger than a clutch bag, coolers, briefcases, backpacks, diaper bags, fanny packs, luggage of any kind, computer bags and camera bags. Fans are still allowed to carry items such as phones, binoculars, blankets and cameras into the stadium. "The safety of our fans is our top priority on game day," said Jeff McCracken, Chief of UNC Police. "Implementing this policy will allow our security staff to screen bags more effectively and to ensure a safer game day experience for all visitors to Kenan Stadium."